We have reached the end of the diary entries that Jean La Forêt wrote in his small journal. This week I have only two pages to share. 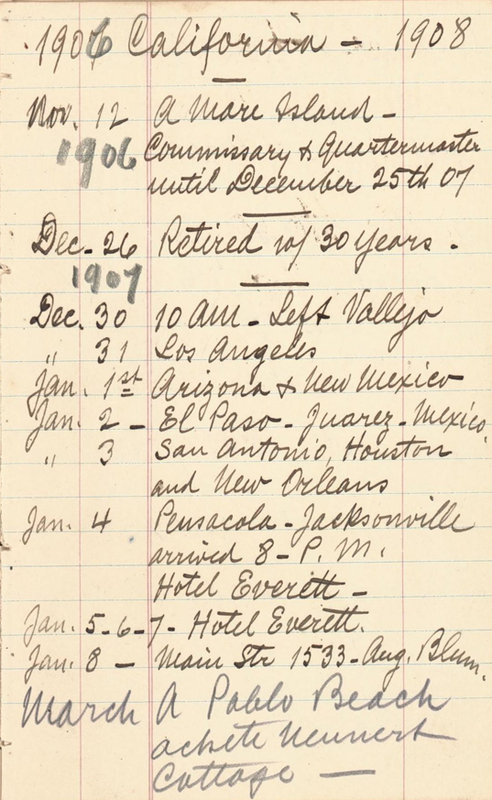 The last entry from last week's pages was dated November 12, 1906, when Jean arrived at Mare Island, California, and he begins with that date on the next page. Dec. 26 1907 Retired w/30 years. Jan. 2 – El Paso. Juarez. Mexico. Jan. 8 – Main Str 1533 – Aug. Blum. Quitte Pablo Beach p. St. Louis 13–15 Avril 1909. 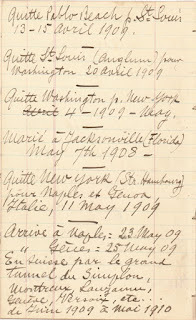 Quitte Washington p. New York Avril 4 – 1909 – May. January 2 El Paso. Juarez. Mexico. January 8 1533 Main Street – Aug. [August?] Blum. June 1909–May 1910 In Switzerland via the great Simplon Tunnel, Montreux, Lauzanne, Geneva, Versoix, etc. These pages, as with last week's, were not difficult to translate, because the words were mostly place names or in English. Here again Jean used both English and French. Whereas earlier he went back and forth, here he wrote almost entirely in English until March 1908, when he switched over to French. Maybe he was getting his brain in the right mode for his impending return to Europe. I have to admit, I was amused to see that Jean wrote an entry for his marriage a year after it occurred. Kind of makes you wonder why he didn't include it at the time, and why he felt the need to add it when he did. 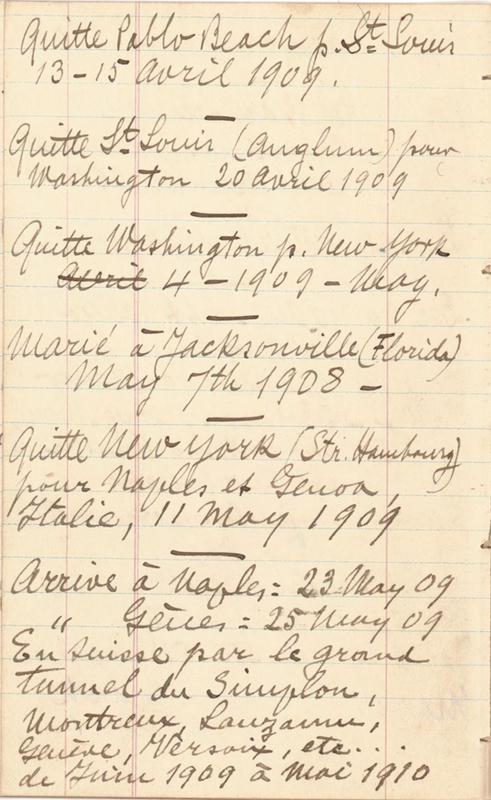 Going by the rest of his timeline, it does seem that the marriage should have been in 1908, as it took place in Florida, and when Emma applied for a pension based on Jean's military service, she included a transcription of the marriage certificate, which gave the same date and location. When I wrote about Emma (Schafer) La Forêt's 1917 emergency passport application, I wondered when and how she had met Jean. 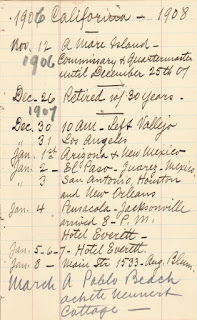 While nothing in Jean's journal indicates that specifically, it appears almost definite that he knew her in Vallejo and that they probably planned to be married before he left on his cross-country trek in early 1908. Otherwise the fact that they both ended up in Pablo Beach, Florida by early May is a pretty impressive coincidence. She might have even traveled with him, but we don't know. On the other hand, I suppose it is possible that he left, arrived in Florida, and they missed each other so much she immediately followed him out there. We'll probably never know the answer to that question. However they got together, they lived in Pablo Beach (which is now Jacksonville Beach, in Duval County, Florida) for about a year and then left for Europe. Their itinerary looks like it could have been a honeymoon. It's also possible Jean had already been chosen for a position with a consulate and they used that as an excuse for the tourist-type trip. I had never heard of the Simplon Tunnel, so I had to look it up. Now I know it's a tunnel that connects Italy and Switzerland. I noticed the short stop in Anglum, Missouri, before the departure for Europe. My guess is that's when they dropped off Emma's children from her first marriage, who had been living with her in Vallejo. As I discussed when analyzing Emma's registration as an American citizen in Switzerland, the kids were living in St. Louis and not with Jean and Emma in Europe; they had to be with someone, and her family members were still in Anglum. One event that Jean did not include in his journal was the birth of his daughter, Rosita. According to Emma's emergency passport application, Rosita was born September 9, 1909 in Versoix. That falls squarely during the last year Jean listed. 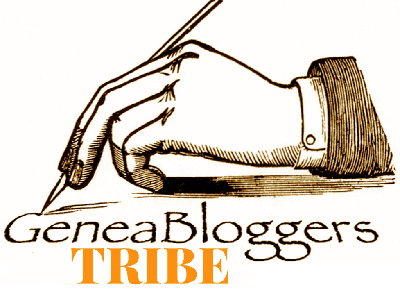 Maybe that was another afterthought entry, like his marriage, and it was written on a page that did not survive. Two items that stumped me in these pages are "Aug. Blum." and "Neunert." My guess is that Aug. Blum. is a person's name, but I don't understand the context for it in the January 8 entry. Maybe it was the owner of the address at which Jean was living? And I'm not sure I'm even reading "Neunert" correctly. If it's a name, maybe that's who he bought the cottage from in Pablo Beach. More research for the future!